The creators of Muncha! Muncha! Muncha! return with a delightful fairy tale. 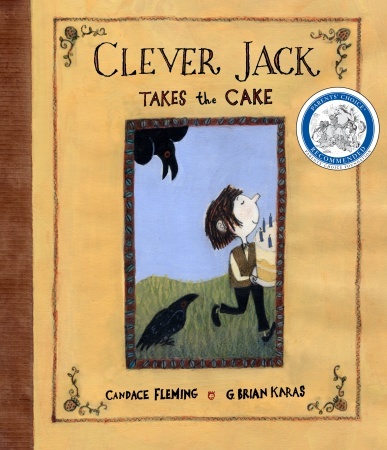 Jack is invited to the princess’ tenth birthday but has nothing to fine enough for a present. But then Jack has a great idea, he will bake her a birthday cake. He didn’t have enough money to buy ingredients, so he had to trade for them, work for them, or make them on his own. Finally it was finished. Two cake layers, frosting, ten candles, walnuts and a big strawberry. Jack sets off to the party, but his way is not easy. Blackbirds fly at him and steal the walnuts from the top of the cake. To cross a bridge he has to give a troll half of the cake. The candles are used up escaping a dark, frightening wood. A bear eats the last of the cake, but not the strawberry. So all Jack has to give the princess is the big, juicy berry. But he still has to get into the castle and all the way to the princess. When I opened this book, it was like returning back to a beloved tale. Fleming and Karas have created a new tale with the soul of a classic. From the premise of the poor boy taking a present to the series of disasters, readers will find themselves happily on familiar ground. That is not to say that there are not surprises, there are and they are great fun! Fleming’s writing is adroit, offer just the right amount of text per page, just the right amount of detail, and pacing the book perfectly for young listeners. Her prose is a joy to read aloud, the phrasing fitting perfectly in the mouth. This is quite simply a book that must be shared aloud. Karas’ art is winningly done. Jack’s mop of messy hair, his skinny frame, the dramatic moments of the birds, the troll, and the bear that have great perspectives. He also plays with the background, washing the illustration of Jack’s home with a dull overlay, gradually blending from white to a warm pink when the princess enters the book. All of the small details add up to a richness and charm that really add so much to this book. A delight, this book must be shared to be fully enjoyed. This is one that must be added to any story time or unit on birthdays, cake, or fairy tales. But it should also become one of those books that you use any old time when you need a winner. Appropriate for ages 4-6. 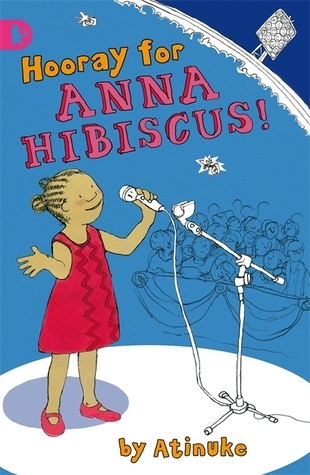 Anna Hibiscus lives in Africa in a great big house filled with relatives, including her parents, her little twin brothers, her grandparents, her many aunts, her many uncles, and all of her cousins. She is never lonely because there is always someone to play with, share stories with, and have fun with. In the first book in the series, Anna Hibiscus discovers that it’s not so easy to have a family vacation with just your small family. She meets her Aunt Comfort who lives on the other side of the ocean, though she frets that Aunt Comfort will have forgotten how to be African. Anna Hibiscus also learns about hard work and dreams of seeing snow for the first time. 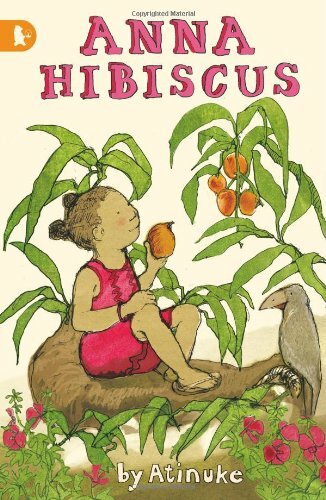 In the second book in the series, Anna Hibiscus sings before a crowd, refuses to get her hair braided, loves the quiet of nights without electricity, and travels to the other side of the city. Obviously written by a storyteller, these books are unique and offer American children a fascinating glimpse of life in Africa that is guaranteed to break stereotypes. The stories are all set definitively in Africa and all of the stories have a focus on things that make Africa special. Another positive for the books is how the simple pleasures of life are the best, something that so many children in America need to learn. Anna Hibiscus is a great protagonist. She is still learning herself about the differences between her own life and that of the poor children she sees around her. She learns about this in very concrete and tangible ways that children in any country can relate to. Nicely, Atinuke has created books for children that instead of shying away from difficult subjects like poverty embrace them and focus attention about them. Atinuke’s use of rhythm and repetition in her stories adds to the feeling of them being written by a storyteller. There is also a powerful tie to the oral traditions of Africa thanks to these storytelling phrases. Beautifully written and wonderfully simple and straight forward, these books are something very special. Highly recommended, these books belong in all public and school libraries. They are a wonderful modern look at Africa and the people who love her. Appropriate for ages 5-7. Reviewed from copies received from Kane Miller. Also reviewed by Fuse #8.